Team Envyus managed to go the entire six weeks of Overwatch Contender’s first regular season undefeated, and proved it wasn’t a fluke during today’s Grand Finals at Blizzards new esports arena. First they swept FNRGFE in a best-of-five semifinals where the latter looked good but not good enough. Despite taking a point off the soon-to-be champions on Eichenwalde in the second round they failed to keep pace and secure the rest of the win, going on to hit a brick wall in the form of Envyus’ defense on the third map when even a final, five ultimate rally late in the game failed to phase the latter. Things didn’t go much better for fellow finalists Faze Clan either. Envyus managed to stomp them 4-0 in a best-of-seven series as well, with the calculated mayhem on Route 66, the last map, going their way whenever it counted most. A series that otherwise might have looked close moment-to-moment ended up unquestionably one-sided due to the diversity of Envyus’ team comps, their flexibility playing around them, and several of the players, like Hyeon “EFFECT” Kim and Timo “Taimou” Kettunen, able to pull rabbits out of their Overwatch hats whenever Faze started to ask serious questions of them. In the latter part of the match, Taimou played on Bastion to secure the payload’s advance by constantly swapping back and forth between recon and sentry modes, posting up in key areas for only the few seconds that were necessary to force an opponent back or pick up a kill before moving onto the next area while his teammates capitalize on the damage output. 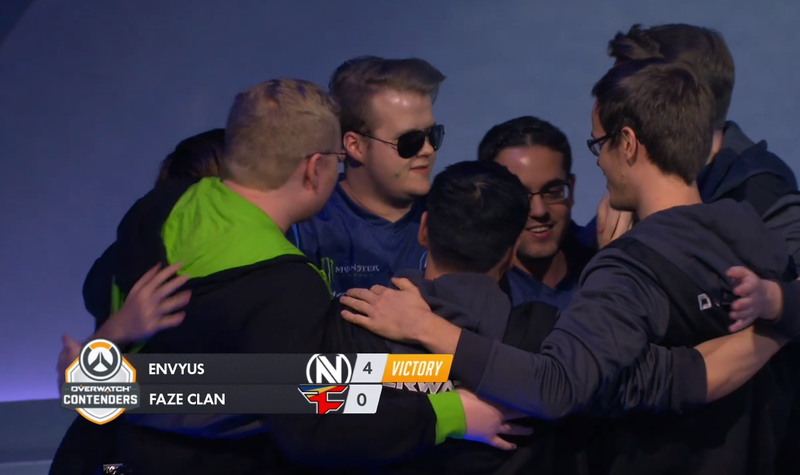 Envyus has come a long way since last year’s ESL Showdown when they took first place to qualify for North America only to be relegated to a fourth place finish in the main event. Since then they’ve competed respectably in South Korea’s APEX League, winning the whole thing in season and placing fourth in the most recent one. But their commanding finish in Contenders makes them a top team going into Blizzard’s Overwatch League next year when the squad will be competing as the Dallas Fuel (although the majority of the teams and rosters have yet to be announced). It’s also the first LAN win for the team since Brandon “Seagull” Larned came out of retirement to join the team a few weeks ago. You can watch the finals in their entirety below.